A cat emergency is something that we cat owners hopes we never have to deal with, but unfortunately our cats have a curious nature and this can mean that from time to time they can get themselves into trouble. It is not always possible to get a cat to a vet straight away, although this is the best option in most cases. Sometimes you will have to carry out some temporary treatment until the vet can see them. 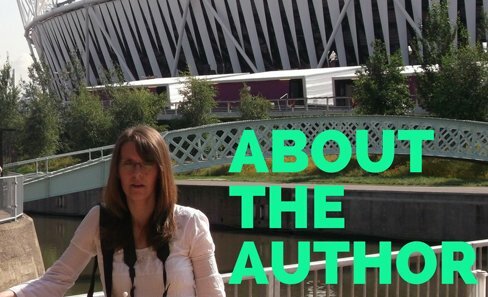 That’s what this page is all about. I will list the most common forms of cat emergency and cat injury, along with how you should treat the cat. Remember it is always advisable in all these cases to have a vet see your cat as soon as possible to prevent possible further infection or injury. Always have a first aid kit to hand, you never know when you may have a cat emergency. If you find your cat unconscious or collapsed then the first thing you will need to do is to assess his general condition and to see if the cat is conscious or not. 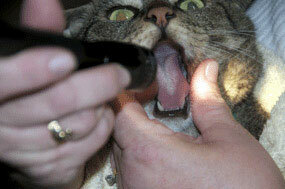 This examination should only take a few minutes do not prolong as the cat may be pain but unable to react. Open the cats mouth and pull the tongue gentle forward out of the mouth to prevent choking. Make sure the head is tilted downwards so that no excess fluid will flow back down the cat's throat. Count how many times the cat breaths out over a period of a minute. It should be 20 to 30 out breaths a minute. Count your cats heart beats it should be 160 - 240 beats per minute. 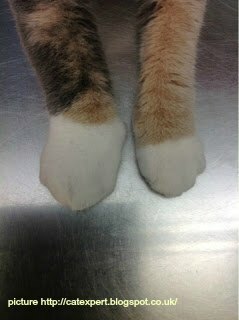 To find the pulse place two fingers inside the top of the cats hind leg. To find the heart beat place two fingers behind the cats elbow area. To see if the cat has any level of consciousness gently flick the tip of the cat's ear. If they do have some consciousness then the ear should twitch afterwards. You can also gently squeeze the cat's toes; if they react then they are conscious. It is important that you do not pick an unconscious cat up in the normal way as this can cause further injury. Instead if the cat needs to be moved, slide them onto a towel and get someone to help you pick the cat up as if it were on a stretcher. After a severe injury a cat may go into shock. Turn the cat over every 5 to 10 minutes if they are unconscious, they should not remain on one side for too long. Although in most cases cats will not harm themselves if they fall from a tree, there are other occasions where they may fall from a greater height or hit themselves on the way down. It is important to keep windows closed on upper floors as many injuries occur from cats falling from windows. 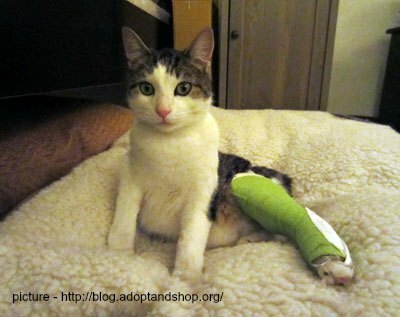 Never attempt to put a splint on a suspected fractured limb as this will cause the cat much distress and is likely to cause more damage. Instead gently place the cat in a box and transport to a vet as soon as possible. The earlier the vet can get to see them the better. If your cat's heart beat and or breathing have stopped there is a chance that you can save them by providing resuscitation. If you can get the cat to start breathing again within a few minutes there is a chance that you could have saved your cats life. Pull cats tongue forward, this may stimulate the cat to breath. If does not work place your hands on the cat's chest and apply gentle pressure down to expel air from the lungs and for new air to fill them. Repeat every five seconds until cat is breathing. Breath into the nose for two to three seconds, you should see the chest inflate a little. Pause for two seconds and repeat. Place fingers on the chest area near to where the elbow and press down gently but firmly five to six times at one second intervals. Then press down on chest area to refill lungs. Alternate between the two. This can be done for up to ten minutes. Cats generally don't like water and will stay away from it but accidents can happen, especially where kittens are concerned. This is what to do if you find an unconscious cat in the water. Pull from the water and hold by both back leg feet. Swing gently to remove water from lungs. 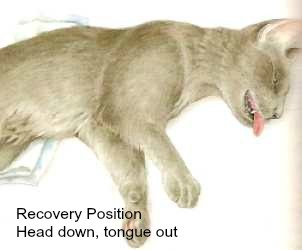 If the cat is still unconscious then carry out the correct resuscitation technique depending on if they are breathing and or have a heartbeat. 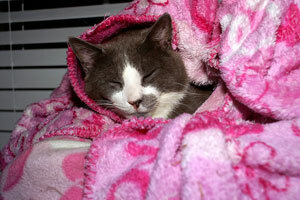 A cat that is having difficulty breathing needs to see a vet as soon as possible. However there may be times when emergency action may be needed such as in the case of a foreign body such as a fish bone getting caught in the cat's throat. Keep the cat as calm as possible and open the cat's mouth. Use a torch if necessary to see if you can see the object. If you can (with the help of someone else), try to dislodge the object with tweezers of a handle of a spoon. If this fails turn the cat upside down to see if this dislodges the item. Never try to remove objects from a cat's eye or ear with tweezers. This is likely to cause further damage. Instead, if the object is loose and not lodged in the eye or ear you can try to remove it using a few drops of olive oil to float the item out. Cats are notorious for getting into places they shouldn't and for be curious. These two thing combined is a perfect recipe for them to come into contact with various chemicals and poisons. Antifreeze, rat poison, alcohol, painkillers, household or garden chemicals. If you suspect your cat has consumed any of these items or similar you should contact your vet immediately. Car Oil, paint and glue are the three most common poisons to get onto a cars fur. Never use solvents or paint stripper on your cat's fur as these are toxic. If the substance has dried then clipping it out of the cat fur is the best option. If the substance is still wet, rub petroleum jelly into it which should help you to comb the substance out. Once all the substance has been removed, wash the cats coat with a mild cat or baby shampoo and dry using a towel to prevent the cat licking himself too much. 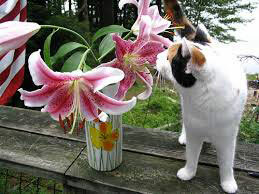 There are many plants which are toxic to cats both inside and outside of the house. Please see my page about toxic plants for which ones to watch out for. Again if you suspect your cat has eaten a toxic plant you must seek advice from your vet immediately. Depending on where you live in the world, your cat may come into contact with all sorts of dangerous animals and insects. Most stings although painful will ease over a short period of time. However if your cat has excessive swelling, seems disorientated, is unsteady on their feet or is having trouble breathing you must seek urgent vet treatment. For a less serious bee sting you can remove the sting using tweezers and bath the area with a weak solution of bicarbonate of soda and water. Using an ice pack will help to reduce swelling. All countries have snakes and spiders but some have more dangerous ones than others. You will know the dangers of these creatures in your own area, but all bites will need to be treated by a vet. A snake bite will look like two puncture wounds deep in the skin. To slow the spread of the venom apply a cold compress and then a compress bandage just above the bite area. Contact the vet immediately. A bite from a cat is nasty as they have lots of nasty bacteria in their mouths which can cause infection. In most cases an abscess will form and after a few days should burst of its own accord. At this point you should clean it up with a mild solution of salt water. However in some cases the wound can become infected or the abscess does not burst in which case it will become very painful. A vet will be able to lance the abscess and treat any infection with antibiotics and in some cases a painkiller. A burn from hot water, hot oil or fire is probably the most common form of scold a cat may be unfortunate to get. Whilst contacting your vet you can help to alleviate the pain and possibly prevent further damage to the skin by swabbing with cold water. Then an ice pack of some description should be held against the area. Do not put anything onto the area apart from petroleum jelly and do not attempt to cut away any fur. Burns can be deep and your vet will need to assess the damage before proper treatment can be given. Some cats and in particular kittens, may chew cables and wires and this can cause electric shock and burns to the mouth and lips. 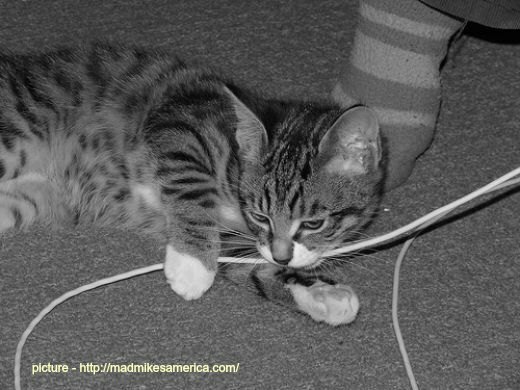 Turn off power or remove wire from the cat using a wooden handle of a brush. 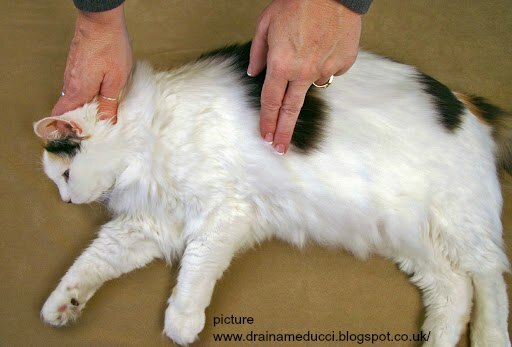 Check to see if the cat is breathing and has a heartbeat, if not commence resuscitation. Keep the cat warm and contact a vet immediately. Heat stroke can happen quickly and if not treated rapidly can be fatal. You need to cool the cat down; the best way to do this is to wrap a wet towel around the cat's body. Do not use Ice water as this will be too much of a shock. The cats breathing should slow within 5 minutes. Offer the cat some water to drink and if the symptoms persist consult your vet. The most important thing to remember during a cat emergency is remain as calm as possible. The cat will pick up on your anxieties and cause it to become afraid and lash out. Quick, gentle treatment in all of these cases will help your vet to ensure that your cat recovers from their injuries. Remember that in all of these cases a vet must be called to have the checked over and treated. This may be expensive but is essential. Please consider pet insurance for your pets, it really does make these emergency situations a lot easier to handle.